Consider yourselves forgiven for forgetting that Samorost 3 was actually announced way back in 2013. We had too, largely because developer Amanita Design has been pretty quiet since then. But today the studio rolled out a new teaser video and website to announce that the game will be out later this year. The bad news for anyone looking for a specific release date is, that's it: The site literally says that Samorost 3 is "coming out later this year." 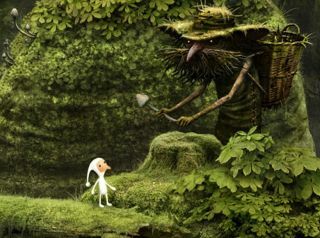 The teaser is great, though, and so are the screens, which are almost disturbingly detailed and lifelike, while also still very "Samorost," too. For those who aren't sure what that means (because it is, I admit, not the most universally descriptive term ever), the original Samorost can still be played in full at the Amanita Design website. It's quite simple as point-and-click adventures go, and could probably be completed by just poking at things randomly to see what they do; the appeal is in the setting and characters, which are almost impossibly whimsical and thus unpredictable. Samorost was actually Amanita's first game, released in 2003, and really set the tone for what the studio would do in the decade-plus since. If you dig it, there's also a demo for Samorost 2, as well as the outstanding (and equally unusual) adventures Machinarium and Botanicula—which, I should note, we thought was quite good.